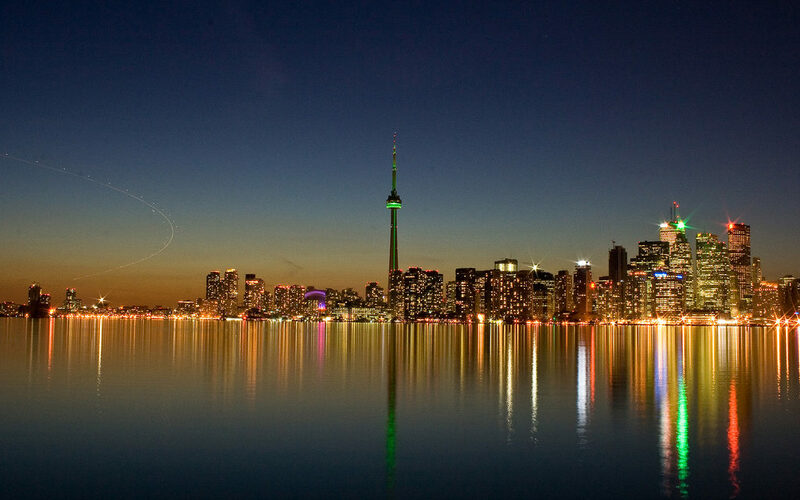 Toronto is a traveler’s dreamland. 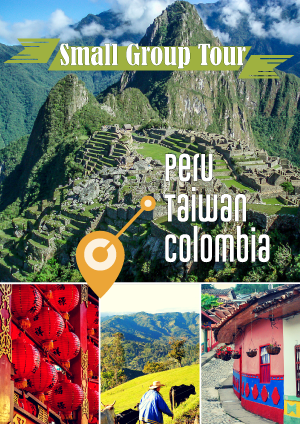 Not because it itself is especially exotic—it’s marred by skyscrapers, pollution, and transit problems caused by excessive suburban sprawl like any other good North American city—but it also proudly ranks as one of the most multicultural cities in the world, giving resident travelers a unique opportunity to explore the globe on a public transit Day Pass. So if you’re traveling to Toronto and feel like seeing the world, don’t spend more than a day on tourist lures like the CN Tower, SkyDome, Yonge & Dundas and the Bata Shoe Museum, and venture instead into the city’s myriad ethnic enclaves for an authentic taste of what makes this metropolis truly unique. Along Spadina Avenue in Toronto’s Chinatown. Photo by Terry Ozon. 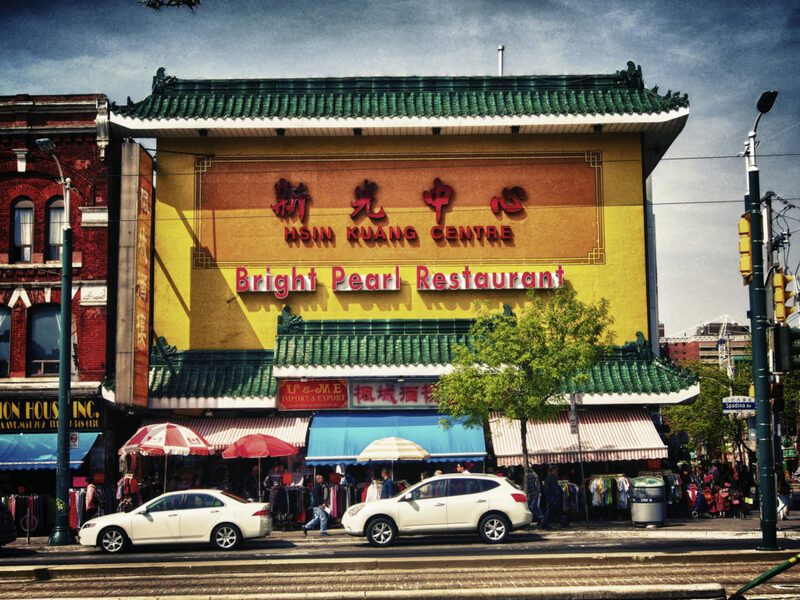 One of the city’s largest ethnic neighborhoods, Chinatown sprawls out in all directions from Dundas Street and Spadina Avenue. Formerly a Jewish community until their migration north (and the Chinese migration west), remnants of brick synagogues pepper the otherwise overwhelming Chinese fonts, street signs and shops. Cheap bakeries offer some of the best barbecue pork buns north of the border, while restaurants like Rol San and Rosewood are consistently voted the best dim sum spots in the city. While the neighborhood has grown undoubtedly beyond its ethnic Chinese scope (which is, itself, problematically enormous), the addition of Korean, Japanese and Vietnamese restaurants hasn’t harmed its appeal one bit. Here, grocery stores are bustling, busy and jam-packed with dried fish, ramen noodles, and exotic fruits—a true taste of all sides of China. Off to the east side of central Toronto lies the Danforth, as much a thriving community as a single street. Though home to a variety of ethnic immigrants because of its cheap decentralized location, the Danforth is forever synonymous with Greektown: from the hefty gyros at modern Messini to the classically rambunctious and delicious Avli, go for a meal and there’s no chance you’ll leave hungry. (If, by chance, you are, swing by Athens Pastries for any of their fine creamy desserts.) But beyond the skewers of meat and feta-filled salads, Greektown has recently evolved into a vegan- and eco-friendly neighborhood. Hit up the Carrot Common for health food stores, organic juice bars, and gourmet coffee shops. 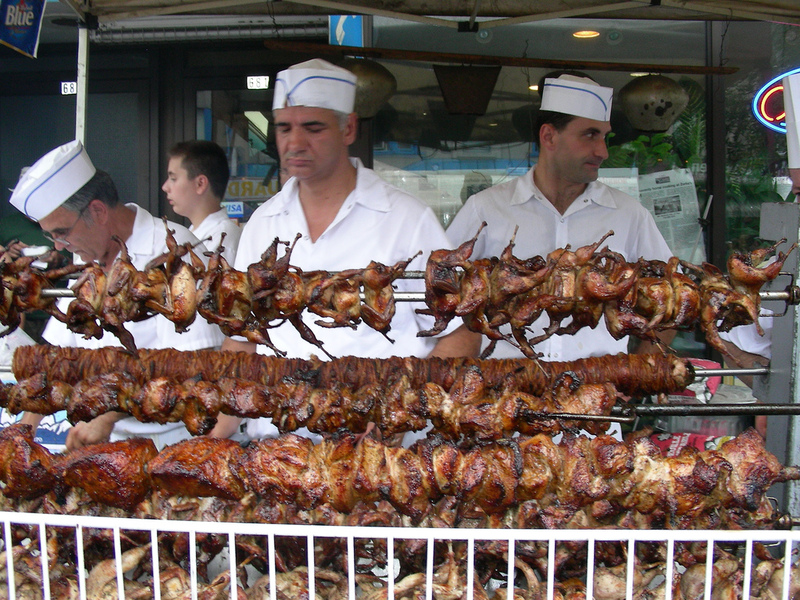 If you’re around in August, be sure to check out the Taste of the Danforth, one of the city’s largest street food festivals and an icon of Greek-Canadian culture. Vendors selling quail at Taste of the Danforth. By flickr user Lord of the Wings. Forget the pizza and pasta—what makes Little Italy worth hitting up is its non-stop nightlife. Live music spills out onto the brightly lit College Street between Ossington and Bathurst, while young, fit, well-dressed people walk the streets, ready to party long after the subway stops running. While most older Italian demographics have moved to other Italian neighborhoods—Corso Italia on St. Clair, or Woodbridge outside the city center—Little Italy remains emblematic of the nation’s historical involvement in Toronto, and is a prime go-to spot for chic pizzerias and popular gelato shops. If you’re feeling touristy, head over to the Royal Cinema and check out the Italian Walk of Fame for tributes to international stars like Dean Martin, as well as local characters like supermarket and media mogul Johnny Lombardi and NHL superstar Roberto Luongo. For a fix of bibimbap, private karaoke, and kimchi with every meal, Koreatown—a short stretch just west of Bathurst and Bloor—is one of the strongest Korean communities in North America, and the largest single concentration anywhere outside of the Korean peninsula. Koreatown fills the basic snack needs of any good Korean (rice cakes, walnut pastries, fish-shaped red bean cookies) and goes the extra mile in supplying shots of soju alongside steaming bowls of pork-bone soup and endless barbecue meats, while signature Korean businesses such as a Korean Exchange Bank branch and even a shop called E-Mart can help make any Korean feel at home. Koreatown along Bloor Steet. Photo by Chung Chu. With a scope wide-reaching beyond its traditional Dundas Street West stretch, Little Portugal encompasses a medley of Portuguese and Brazilian culture, complete with sweet bread bakeries, churrascarias and a burgeoning arts and culture scene. Foodies can indulge along the College Street stretch by visiting low-key Bairrada Churrasqueira or the significantly more upscale Chiada, topping the evening off with a Portuguese wine and tapas (chorizo? Duck confit? Take your pick) at Salt Wine Bar on Dundas. In truth, though, Little Portugal is being transformed by an influx of South and Southeast Asian businesses, while some of the city’s finest classical Portuguese bakeries like Courense and Nova Era have shot up north to Bloor Street—a treasure trove of cheap, buttery goodness, with a clientele of steady Brazilian regulars sipping drip coffees while watching soccer on the hanging widescreen TV. This enclave of South Asian culture is perfect for off-the-beaten path travelers, on account of its inconvenient distance from proper downtown Toronto. But make no mistake: it’s easily reachable by bike or public transit, and well worth the excursion. 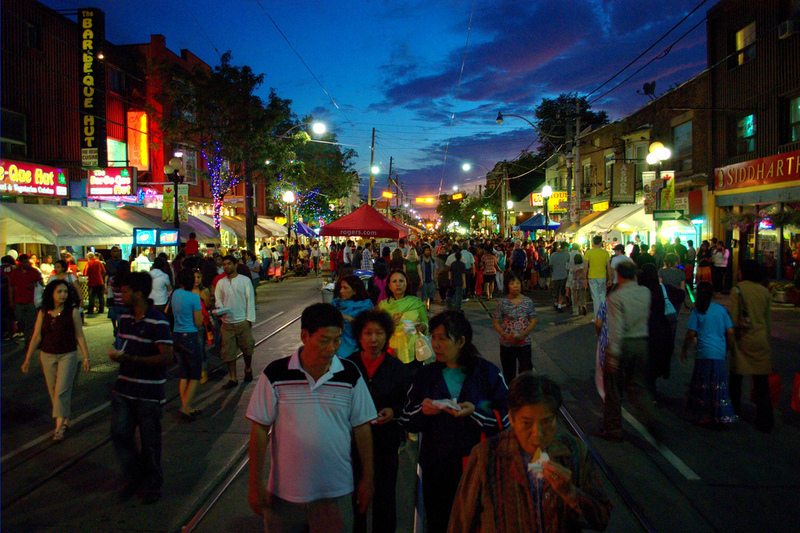 Also known as the Gerrard India Bazaar, this eastern city stretch, from Gerrard Street from Greenwood to Coxwell, is home to some of the city’s most colorful street vendors and authentic Indian restaurants. While no longer technically the sole home to Toronto’s South Asian population, which has since branched off into suburbs and beyond, Little India still feels authentically cozy: Gerrard Art Space and Lens Work keep the local arts flavor alive, while hit restaurants like Lahore Tikki House offer plentiful menus of veggie-friendly paneer, fried dosa, and buttery naan. Paan joints, sari shops, and South Asian fruit markets line the streets, which are equally home to Bangladeshi and Pakistani cultures, too. 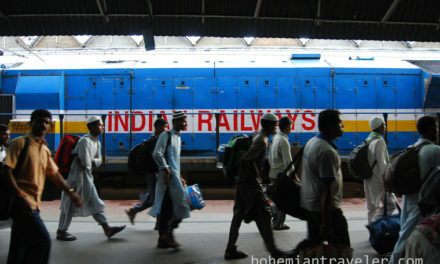 The Festival of South Asia. Photo by Ian Muttoo. Effectively known by its street name, Roncesvalles, this west-end stretch north of Sunnyside Park on the cusp of Lake Ontario is one of the hippest neighborhoods in town—and by now, everyone knows it. Innovative theatre spaces, award-winning cafes and ice cream parlors, and a quaint movie house make Roncesvalles a go-to destination for young urbanites, but its roots lie with Toronto’s Polish community. Polish bakeries and butchers line the streets, with Cafe Polonez and Super Kolbasa & Deli being especially long-standing icons for pickle soup, pierogies and sauerkraut on bread dumplings; meanwhile, September brings the annual Polish Festival, the largest in North America. But surrounding these mainstays is a fully gentrified yuppie neighborhood: city-famous indie cafes and bars like The Local and Roncy’s Bean are what draw hipsters here, along with some of the city’s few segregated bike paths and parents with strollers at every turn. Malta Park in The Junction. Photo by Ian Irving. Here’s one even local Torontonians don’t know about: after World War II ended, the city saw an influx of tens of thousands of immigrants from Malta, a small Mediterranean island country south of Italy, one-tenth the size of Rhode Island. By the 1970s and ’80s, there were reportedly over 45,000 Maltese living in Canada; by the 2000s, fewer than 4,700 Torontonians identified Maltese as their first language. Today, Little Malta, a short few blocks along Dundas Street West just south of the railroad tracks, is a shadow of its former self, remembered mostly by Malta Bake Shop, a haven of pastizzi, qaq-tal-ghasel and almond tarts. But the surrounding neighborhood is now known as The Junction, a far but thriving community with several bars and young urbanites. Take a stroll through the quaint Malta Park, though, and you’ll see remnants of the area’s forgotten past.